Increased Court fees create a potential barrier to access to justice and increases the costs and risks of litigation. This is as obvious as it is unattractive. When the Government, after a short round of consultation, introduced massive increases in Court fees on the 9th March 2015, there were many protests on the grounds of affordability and access to justice. Looking at the large personal injury litigation market, the Government’s position appeared to be that cases were often run and funded by lawyers and that Clients’ were likely to be insulated from the effects of the increases by the lawyers and funders, with the loser’s Insurers ( Liability or ATE Insurers on either side of the industry) picking up the ultimate cost of the increased Court fees. However, there seemed little thought for the effect on Commercial and Professional Negligence Litigation. For example, because Court fees were now set at 5% of the claim value ( subject to a maximum of £10,000), a small business, where its main customer defaulted on a £100,000 contract, would have to find a Court fee of £5,000 out of its depleted revenue, to issue any Court proceedings. The fee would rise to £!0,000 if the claim was for £200,000 or more. Likewise, a Professional Negligence Claimant is unlikely to find such favourable funding terms as are available in the personal injury market, not least because of Qualified One Way Cost Shifting (QOCS), which means that in most personal injury cases the losing Claimant is not liable for the Defendant’s costs. QOCS does not apply to Professional Negligence or Commercial claims and the Claimant has to find funding for his own costs and disbursements and the potential liability to pay the Defendant’s costs. The burden of funding disbursements such as Court fees was not felt to be too burdensome prior to the Court Fee increases as the fees were quite modest. However, when a Court Fee rises from a few hundred pounds to a few thousand pounds it changes everything. The Client may not be able to raise the funds to pay the fee and the Lawyers may not be able to fund it from their own resources, as the total outlay would become unmanageable, once a few claims had to be issued at Court. There is a funding solution for acceptable cases, which involves the provision of credit for Court fees being provided by a Third Party Funder. However, the cost of the credit is quite expensive and can burn a further hole in any damages once any Success Fee and ATE premium have also been deducted from the damages. Some might say that the Claimant has still got access to justice and is simply sharing the cost of going to Court with the deductions from his damages. However, there is a risk that some genuine cases will not have any funding available for the Court fees and this could become a serious obstacle to access for justice. 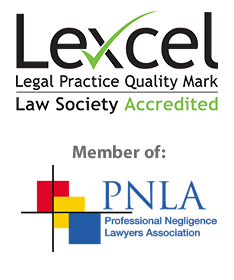 In our firm we specialise in professional negligence claims against Solicitors and other Lawyers and the new Court fees do present a new challenge and must be managed in each case depending on the circumstances. However, we are committed to finding an acceptable funding solution in each case so that our Clients can still proceed to litigation and sue their Solicitor or other Lawyer, if this becomes necessary. After all we share a common interest in being able to proceed with meritorious cases as our business depends upon it. However, there are deeper and darker problems, caused by the huge hike in Court fees. A Defendant can now sit back and dare a Claimant to risk issuing proceedings and sue their Solicitor in the knowledge that the Claimant will have to put a large sum of money down as the Court fee just to start the process. Professional Negligence Defendants already often deny claims in the hope that claims will go away and the large increase in Court Fees is only likely to increase the use of this tactic. A further problem arises with the rules as to statements of value when proceedings are issued. The rules state that the Claimant has to state whether the claim exceeds the small claim limit of £10,000 or the fast track limit of £25,000 or does not know. For example, a claim for £15,000 should say that it exceeds £10,000 but is less than £25,000. However, this is only relevant for allocation of track and not the Court fee. The claim has to be limited to a specific Court fee band to benefit from that fee otherwise it is treated as unlimited and the full £10,000 Court fee is payable. It was thought by some that even if a higher value was known or suspected, that a claim could be limited to a lower value and the Court fee paid for that limit, which could then be increased if the additional Court fee was paid. This was helpful for claims which had to be issued quickly for limitation purposes, where the value was uncertain or it was not known whether the proceedings would be required. However, on the 21st December 2015 in Richard Lewis v Ward Hadaway 2015 EWHC 3503(Ch) High Court Deputy Judge Mr John Male QC decided that it was an abuse of process for a Claimant’s Solicitor to deliberately limit a claim to a lower value than its true value and although it was not fair to strike the claim out for abuse of the Court’s process, he entered summary judgement for the Defendant, on the grounds that the proceedings were not valid, as they had never been started in time for the limitation date for the case. This was because when they had been issued by the Court the wrong Court fee had been paid and where this error had been an abuse of process the proceedings had never actually been validly commenced! This does appear to be a very harsh decision but a close reading of the case itself shows that this particular Solicitor had been warned previously about issuing proceedings with the wrong statement of value. On that basis it may have been fair to strike the claim out as an abuse of process and certainly after reading the case I had less sympathy for the Claimant’s Solicitor, but the poor Claimant was left losing the claim ( and there were several Claimants’ cases effected by this decision)and they may now have to investigate a Professional Negligence claim against their own Solicitor. The Judge’s grounds and reasons for refusing to strike out the claim for abuse of process and instead to enter summary judgement for the Defendant in Lewis v Ward Hadaway do not sit comfortably with my sense of justice and I would not be surprised to see the Claimants appeal this decision, although the Defendant could also appeal the refusal to strike out the claim for abuse of process. The end result at the moment is entirely unsatisfactory. It leaves great uncertainty and difficulty with regard to the process of issuing proceedings, particularly where there is any doubt or uncertainty as to the value of the claim. It will encourage Defendants to challenge established proceedings on the alleged grounds that the proceedings are a nullity because an incorrect value had been given at the outset and therefore the correct Court fee had not been paid. It will demand great care and attention by Claimant’s Solicitors at the point of issuing proceedings to ensure that they comply with the rules of Court as currently interpreted. We are well aware of these potential problems and our understanding of the current interpretation of these rules by the Court will ensure that our Clients are protected as much as possible in any proceedings which we instigate when we sue Solicitors or other Lawyers. There could be some cases of litigation where Claimant’s Solicitors blatantly ignore this interpretation and have cases struck out or lost as a result of the incorrect value statement being used. There also may be many litigation cases where Claimants are represented by Solicitors who are oblivious to these developments and risk a finding that the incorrect Court fee was paid. Although, if the Solicitors were not aware of the problem, there may be less chance of a finding of abuse of process, there is still the chance that the Court could find that there had been an incorrect statement of the claim’s value, which had been done deliberately to keep the Court fee down and that this was enough for the actions to constitute an abuse of process, so that the claims are lost, either as a result of summary judgement being entered or a strike out of the claim. In all of these cases the Claimants will need to investigate whether they have a Professional Negligence claim against their own Solicitor for the way that the statement of value has been completed at the time that the proceedings were issued. Matthew Wilkinson Solicitors Limited are experienced in pursuing professional negligence claims involving claims struck out or lost as a result of the negligence of previous Solicitors or other Lawyers and will be pleased to assess any such claims for no win no fee funding.